“I don’t know if you ever heard tell of the Yawp Shore,” says Everett Turner. "Well, we grew up just near there." While Turner has no idea where the name came from, he has plenty of memories about this important fishing spot on the Maurice River. "We moved to a bungalow right across from the road that goes back to Yawp Shore." Turner was two years old at the time, and the year was 1928. As a young boy, he remembers walking over to the Yawp Shore. Turner loves to tell about how his dad would gather up the discarded fish and use them for fertilizer on his farm. "He had the best produce you ever saw - with those shad under it. We used to have people come from all over just to get watermelons," Turner said with pride. Yawp Shore is located south of the confluence of the Menantico and Maurice Rivers on the east shore. The road leading to Yawp Shore from Route 47 bears the same name- Yawp Shore Rd. The place is familiar to so many who work and play on the Maurice River. And most will tell the traditional tale about the origin of the name. Local historian Philip Nutt put it this way in a presentation to the Vineland Historical Society in 1936: "The story goes that the place got its name from the wives of those who followed the water. When a boat would come in sight, coming up the river, they would come to the bank and yell to those aboard, asking if they had seen anything of their men on their voyages. The river men said, 'There is where the women will yap at us.' From that, it went to Yapp and the reach in the river is now called Yawp Shore." Others have attempted to look at the name as a derivative from the Native Americans who once walked the banks of the Maurice River. Ray Whritenour, who has experience translating Lenape texts, gave the name a try. In his correspondence dated August, 2004, Whritenour wrote: "Yawp Shore: "Yape" can be translated to "water's edge." He then speculated, "If the 'shore' is really 'shaw,' then I'm at a loss to know what 'Yap-shaw' means." 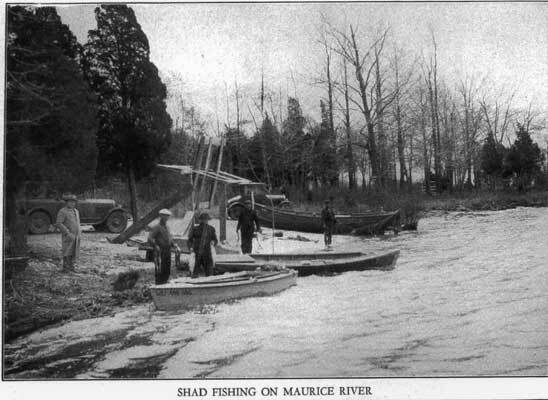 In his book, Indians of Southern New Jersey, local historian Frank H. Stewart wrote: "The name 'Yap-shaw' found in the Maurice River is derived from 'Yapeechen', meaning ‘along the bank'." And the family name Yapp has surfaced in the old deeds of Cumberland County, but no evidence has been uncovered that connects the Yapp name to this place on the Maurice River. Nutt mentioned a man named Garrison and his family who lived on the property at the time when Nutt gave this talk. 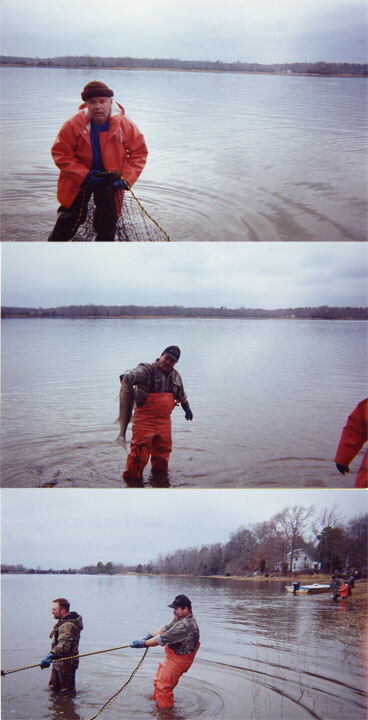 He also said that there was a new clubhouse just south of the spot "and when the fish are running, there are many rivermen that camp along the bank and haul nets for shad and herring." Nutt said this was a good spot for hauling fish because there were "no snags to catch their nets." Another account, written to Jane Galetto in 1987, comes from Charles Stadler. He wrote about the annual sailing race at the Union Lake Sailing Club. Stadler, who was commodore of the club from 1941-57, referred specifically to the race of 1935. He noted that it started at the Maurice River Bridge and proceeded seven miles downriver to Yawp Shore. There, skippers, families and friends would picnic. He commented that while waiting for the tide, Yawp Shore became a "big mud flat." Ralph DiPalma related that his partner Lou Miller once owned a stretch of property on the shoreline at the Yawp Shore. A whole gang of them got together and bought the lot. They used to have summer parties there. The Penningtons live there now, DiPalma said. "They bought the property just there at the Yawp Shore," he said, adding that the house was recently remodeled. Allen "Ike" Cossaboon, Jr., his son Allen and grandson Allen, the 3rd, reminisced about the seasons of successful fishing at the Yawp Shore. Between the three of them, there have been generations of good fishing. They lamented that their family may be the last of the fishermen at the Yawp Shore. "The river is changing its course and it's bringing all the mud up and it's laying it right in front of the Yawp Shore. You can barely fish there now." When the Smalleys lived at the cabin on Acorn Island in the 1960's, they found the Yawp Shore to be a convenient place to leave their vehicles and the boats they used to go back and forth to the island. Donald Smalley would "take the sneak box over to Yawp Shore and anchor it where he knew he would get it when he would get done work at 11 o’clock at night," his wife Julie remembers. "He would have to go with the tide…if the tide was out you would get stuck in the mud. So he would anchor it where he knew he could get it when he got home." During the ten summers they spent at the cabin, the Smalley children, Neal, Clif and Steve often went to the Yawp Shore to catch the "minnies" for their fishing expeditions. And that was the bench mark when they were working on their Cub Scout swimming badges. "The cabin to the Yawp Shore by water is a mile, although it does not look like it," Julie said. She remembers trailing behind the boys as one by one they would swim the distance to earn their badge. Julie Smalley also remembers that there were six families who regularly used the property there at Yawp Shore. There was some talk about building a dwelling there. "They did own a little bit of land behind there, which was a little bit muddy. They wanted to build there - but nobody did," Julie said. "We would go water skiing over there with them, and sometimes we'd have a picnic with them." Frank Shaffer, former big league baseball player and former billiard parlor operator here, narrowly escaped death last evening while fishing for rock just off the Yawp Shore where he is spending the summer." The report said that Shaffer, who was out fishing by himself, was pulling up anchor when his boat overturned. His hip boots filled with water and it made it "impossible to him to strike and swim to safety.” Nearby residents George and Albert Garrison saw the incident and were able to pull Shaffer from the water. The news account says that Dr. Charles Mayhew was summoned and after an hour of unconsciousness, Shaffer was taken home to recover.